This new disc on the Australian label ABC Classics comes from horn player Anneke Scott and the Australian period instrument ensemble Ironwood, and it takes Mozart's Quintet in E flat major for horn, violin, two violas and cello, KV487/386c and pairs it with a group of works from the early 19th century showcasing the development of horn playing during this period, with the use of added valve blocks utilising a technique which mixes hand-horn and valve techniques. 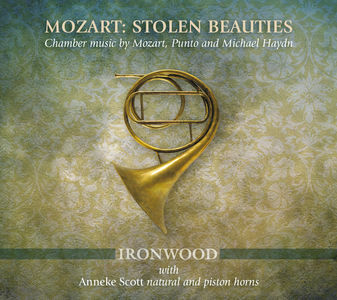 The other main items on the disc are nearly all in fact arrangements of Mozart with an anonymous Ari varie pour corno (sur 'La ci darem la mano') and Barham Livius's Concertante for pianoforte, horn, viola and violoncello arranged from a Sonata by Mozart (Trio in E flat marjo, KV498 Kegelstatt), plus Michael Haydn's Romance in A flat major for horn and string quartet MH806 which is a version of the slow movement of Mozart's Horn Concerto in E-flat major, KV447. Also on the disc are a group of duos by the 19th century horn virtuoso Giovanni Punto. 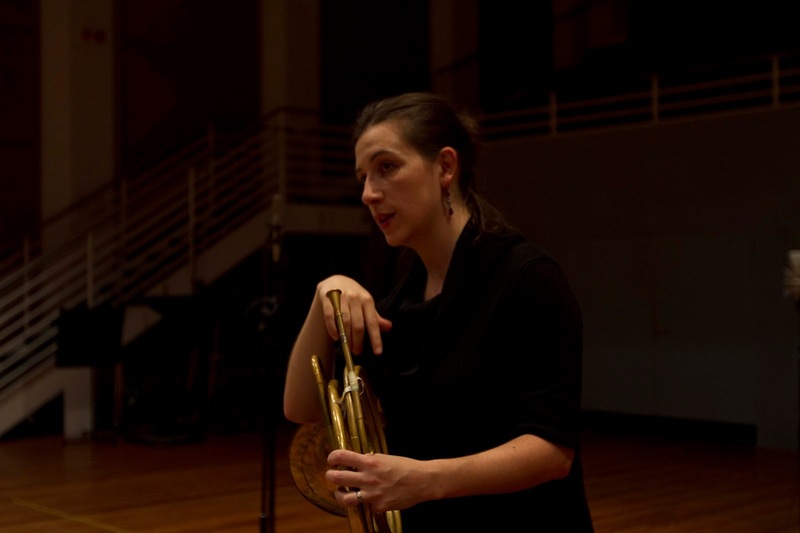 Anneke Scott has recently spent some time exploring the early 19th century natural horn techniques used in Paris notably with music by Jacques-Francois Gallay (see my review of her most recent disc). Whilst the Parisian horn players eschewed valves in favour of entirely hand techniques, other countries adopted the new technology. On this disc Anneke Scott plays a natural horn made in Paris in 1835 to which has been added a sauterelle, a detachable block with two valves. So the player has the combination of hand stopping techniques and valves at their disposal. A key factor in the choosing of this horn was the existence of Barham Livius's own horn, now in the Horniman Collection in London, which has just such a sauterelle and his arrangement of the Mozart Kegestatt Trio uses both hand and valve techniques. For the remaining works on the disc, Anneke Scott played the horn with the sauterelle removed, using purely hand stopping techniques. There is a fascinating video on YouTube where she discusses this (see below). The use of hand stopping techniques on a natural horn to produce the chromatic notes results in a lovely array of different sounds as the horn traverses the chromatic scale. 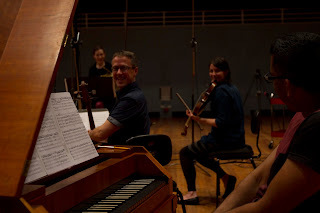 This, combined with the very different sound world created by the fortepiano (a Viennese action one after Anton Walter, c 1790) and the use of late 18th century style bows which come between baroque and modern style, means that even the familiar music on the disc inhabits a pungent sound-world which we are not always used to. The anonymous set of variations on La ci darem la mano comes from a manuscript collection made by the horn player Giovanni Puzzi (1792-1876). Born in Parma, but achieving fame in Paris, Puzzi was brought to London by the Duke of Wellington after the fall of Napoleon. His manuscript collection, which might be the pieces which he played in recital, is now in the British Library and include the variations from 1845. After a rather sober beginning, things take off and it is clear that the variations have one principal aim, to show off the players technique which Anneke Scott does admirably. Michael Haydn's Romance in A-flat major for horn and String Quartet is clearly related to the slow movement of Mozart's Horn Concerto in E flat but we can't clearly say which came first and the truth seems more complicated. Mozart is known to have written music for Michael Haydn to pass off as his own when he was ill. And what happens seems to have been that Michael Haydn sketched something, which was used by Mozart, but then Michael Haydn made his own version. Whatever, it makes a delightful piece and those who know the Mozart concerto well will delight in spotting differences. Dramatist, composer, horn-player, pianist, unsuccessful entrepreneur, Barham Livius is famous for owing Weber money. But he studied horn with Giovanni Puzzi and made an arrangement of Mozart's Kegelstatt Trio for clarinet, viola and piano, for horn, viola, cello and piano. In the first movement we get a pretty straight adaptation of the Mozart, with the clarinet transferred to horn and a cello added to the piano bass, though the tempo marking is Allegro con brio rather than the more sedate Andante which Mozart specified, clearly Livius wanted something perkier. In the second movement he become more daring, with the cello being cut loose from the bass sometimes, so that the horn has a rest in the trio, and Livius cuts Mozart's coda after the second minuet. The final movement is the most successful, with Livius having the confidence to introduce some really dialogue between the instruments including the cello. The work receives a finely balances and appealing performance. Mozart's own Quintet in E-flat major for horn, violin and two violas and cello, KV 407/386c is well known and is a masterpiece of the genre. Written for the horn player Joseph Leitgeb (1731-1811) around 1782 to 1784. The work's manuscript disappeared in the 19th century but luckily it was published in Paris in 1802. In three movements, Mozart balances the horn with two violas in the middle of the texture which frees the violin to take a more concertante part than otherwise. The complex and substantial opening movement start with fanfares but lead into a more thoughtful movement. The lyrical middle movement is one of Mozart's lovely horn slow movements, whilst the final Allegro is thankfully not hunting related and in instead we get something jolly and rollicking. The work stretches the horn players technique, using a wide range (two and a half octaves), arpeggios leaps and scales. What is fascinating about hearing played with period technique is how the different sounds of the hand stopped notes mesh with the scoring and the harmony, Mozart was clearly thinking about the sounds this particular instrument would make in this particular key. Dotted through these major works are a group of delightful duos by another horn virtuosos Giovanni Punto (1746-1803) for horn and bassoon published in Paris in 1802, which the group have transferred to horn and cello. 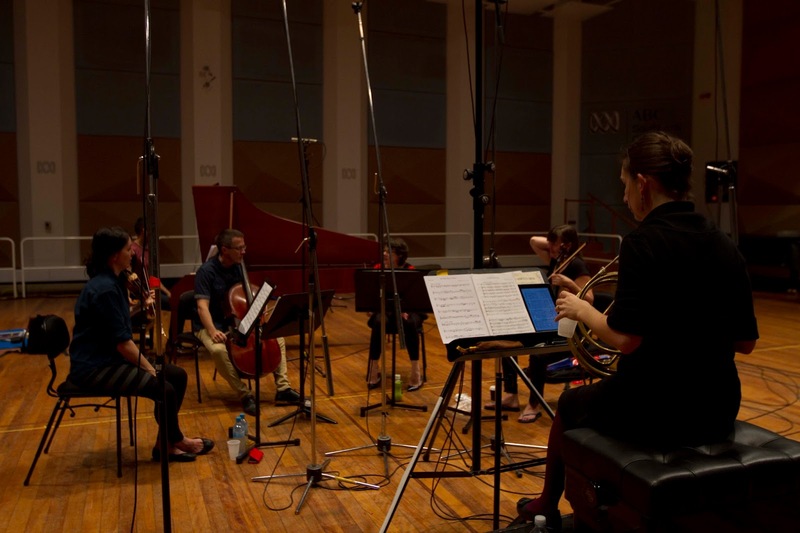 The performances are all exemplary, the players of Ironwood, Alice Evans and Julia Freersdorff, violins, Nicole Forsyth and Heather Lloyd, violas, Daniel Yeadon, cello and Neal Peres Da Costa, fortepiano, need no excusing. They play with consummate technique so that we can appreciate the music in its new colours, without worrying about problems with the instruments. This is a lovely disc and if you have never really thought about the natural horn, then this will introduce you to a whole world of colour and drama.